With the New Year upon us, The Society of British and International Design have given us another exciting and inspiring opportunity to network and learn at 2014’s first Continuing Professional Development networking event. This month’s agenda was lighting design, an evening filled with talks from both commercial and residential industry experts, along with a panel discussion on the increasing use of LED lighting in design. 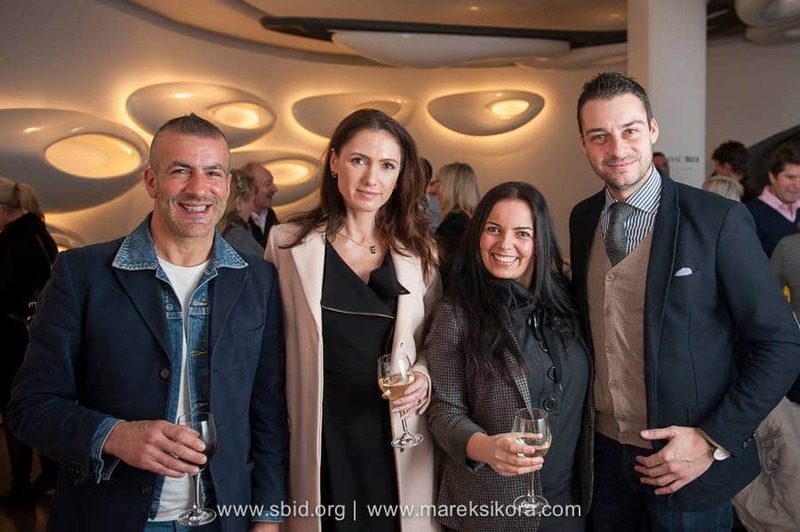 A handful of SBID members and guests filled the impressive Roca London Gallery, a highly stimulating, curvaceous space designed around the themes of water and fluidity, from the eponymous Zaha Hadid Architects. First to present was Calvin Caunter of Vision Accendo, commercial LED lighting specialists. Calvin emphasised the numerous benefits of LEDs vs. incandescent lighting, including their energy efficiency, their longer life cycles and low maintenance properties, as well as the long term financial advantages. Lucy Martin, Design Director at the award-winning John Cullen lighting, delivered an engaging presentation on the fundamental importance of lighting in residential spaces. She touched on the emotive and behavioural impact that lighting has on us, along with the visual control that lighting grants us – enabling us to create focal points around our architectural features, to make smaller spaces appear larger and to make large spaces more manageable. The consideration of surfaces and finishes was also discussed; the way these elements will affect the colour of the lighting and therefore the overall mood of the space. Lucy’s persuasive approach during the talk allowed her genuine passion for lighting to resonate and the overall importance she places on educating people into truly understanding the impact of good lighting design. The third and final speaker for the evening was Kevin Grant of Buro Happold Lighting. With a portfolio of large-scale commercial lighting projects in London, LA and Saudi Arabia to name a few, Kevin provided us with an interesting and impressive overview of the company and their approach to challenges associated with lighting. With spaces in which natural lighting is required but limited, Kevin discussed their use of sun blocking, a technique to channel natural sunlight into a space through tubes which reflect and refract the light, whilst at the same time blocking out the sun’s negative UV affects. The inspiring talks were followed by a Q&A session. An opportunity for Vanessa Brady, President of SBID, along with audience members, to pose questions to the speakers and to challenge some of the points raised. Issues such as the quality of LED manufacturing in many parts of Asia vs. Europe were debated; how to compete with a thriving market elsewhere in the world. The consideration of obsolescence in LED lighting products from design to implementation was another point of interest discussed. With the overall thought for the evening, ‘LED is the future’, I was no doubt more convinced of this conclusion by the end of the event. With the lights dimming, I left the curvaceous tunnels of the gallery inspired by the wealth of knowledge I’d accumulated on the subject and the invaluable conversations I’d had with others in attendance.